Today we have ASRock 890GX Extreme3 in our testbed, and the review promises to be interesting, because ASRock always tries to come up with useful features to attract buyers. AMD chipsets traditionally offer many PCI Express lanes -- enough for a standard amount of normal graphics slots plus a slot with fewer lanes. Even then some lanes will remain. And ASRock makes sure all of those lanes are used. For this reason, ASRock 890GX Extreme3 has two graphics slots which can automatically switch to the x8+x8 mode, if you install two graphics cards. It also has the third slot with 4 lanes. It's interesting that even the latter can accomodate a dual-slot graphics card without blocking access to any peripheral ports. If you only have one graphics card, you should install it into the first graphics slot, because it's the only one with 16 PCI Express lanes. In all other aspects, the motherboard is simple. It offers chipset functionality plus USB 3.0 and FireWire. 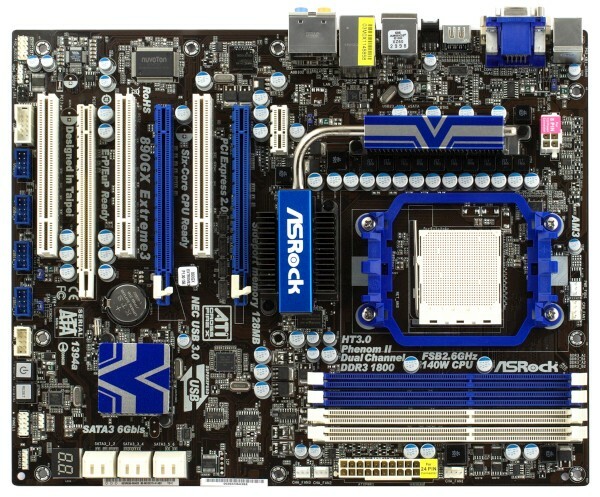 This is typical for most motherboards based on this chipset that we have reviewed. Note that ASRock decided to go without an IDE port. This will be a disadvantage, if you still have legacy drives. Original features include the CMOS reset button. As for the eSATA 3Gbps port on the backpanel, ASRock tells us that it uses one of the chipset ports (ASRock 890GX Extreme3 has all six SATA 6Gbps ports, but lacks an additional SATA 3Gbps controller). But then why does that port only provides 3Gbps bandwidth instead of 6Gbps? ASRock says it's located too far from the Southbridge, so the connecting lane is too long hence throughput limitations. Anyway, the company provides a separate eSATA 6Gbps bracket you can use with one of the remaining onboard SATA ports. The cooling system could be practical, if it weren't for those proprietary covers and such. It was Gigabyte who introduced this trend, and others took it up. Unfortunately, it hardly helps cooling. A cover like that is especially unreasonable on a low-profile Southbridge heatsink. Of course, these fancy covers can only be used, because chipset doesn't get too warm and can withstand high temperatures if necessary. But if ASRock wants to remain an overclocker product vendor, they better do without such covers. The CPU VRM has 10 phases, 2 MOSFETs per each. There are 11 x 820µF and 4 x 270µF capacitors, all solid. ASRock 890GX Extreme3 supports processors with up to 140W TDP. The video buffer is a 128MB DDR3-1333 chip (Nanya NT5CB64M16AP-CG). The box looks nice and the bundle is quite nice, too: 4 SATA cables with metallic latches, a power adapter, a eSATA 6Gbps bracket, a thick user's manual, an Instant Boot and an IES quick guides. Proprietary tools include OCTuner (that has fewer features than AMD OverDrive) and IES for managing power-saving modes. One novelty is OC DNA that can store a BIOS profile in Windows, so you can copy it to another PC with the same motherboard. Perhaps, this will mostly come in handy at forums where owners of these motherboards can share their experience. Third-party software includes Norton Internet Security. 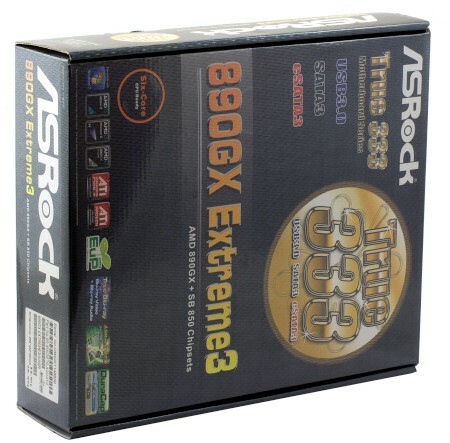 ASRock 890GX Extreme3 is based on the AMD 890GX (AMD 890GX Northbridge and SB850 Southbridge). It supports up to 16GB of DDR3-800/1066/1333/1600 memory, has 6 internal SATA 6Gbps ports (RAID 0, 1, 0+1, 5). Additional controllers are listed below. Integrated audio based on the 7.1-channel VIA VT2020 HDA codec. There's an optical S/PDIF Out on the backpanel. Gigabit Ethernet based on Realtek RTL8111E (PCIe x1). FireWire based on VIA VT6315N (PCIe x1) for 2 IEEE1394a ports, one of which is on the backpanel. USB 3.0 based on NEC D720200F1 (PCIe x1) for 2 USB 3.0 ports. System monitoring based on NuvoTon NCT6771F. This is actually the same Winbond W83677HG, just with a different label. It supports automatic CPU fan control. Unfortunately, SpeedFan, Everest and other third-party monitoring and fan control utilities have certain issues with new ASRock motherboards. Those are related to the use of non-standard fan multipliers and are usually solved in newer versions of third-party utilities. Anyway, everything works fine in BIOS itself. You can set a desired temperature to be maintained (45°C to 65°C) as well as a desired fan speed (from 1 to 9; the higher is the number, the faster will be the minimal rpm). There's no upper limit to fan speed to avoid overheating problems. Only 4-pin fans can be controlled. You can also limit the speed of any of the three system fans by means of similar levels (from 1 to 9). Overall grade: Very good. VIA audio codec is almost the same as Realtek ALC892. While ALC892 can formally sound better, the difference is hardly audible.